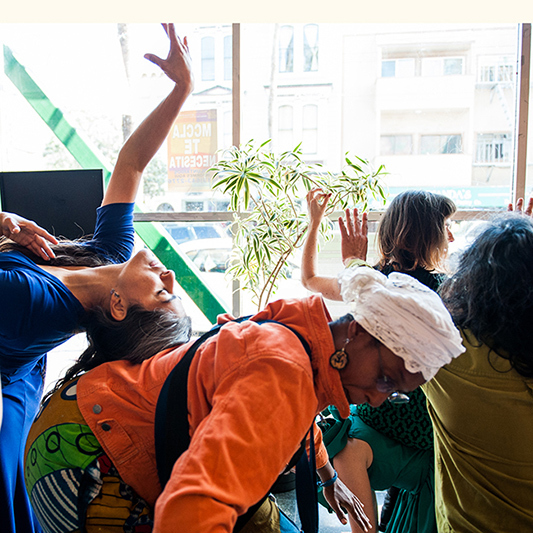 Choreographer Liz Boubion of the Piñata Dance Collective created a dance anywhere® event at the Mission Cultural Center for Latino Arts. The performance included dancers Liz Duran Boubion, Stephanie Sherman, Dominique Nigro, Livier Ayon, Janine Trinidad, Afia Walking Tree with a cameo by Adrian Arias. Together, the dancers performed a structured improvisation, exploring space, environment and the experience of passersby. 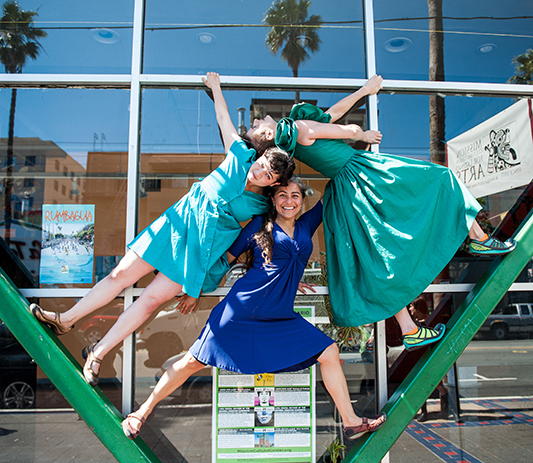 The Piñata Dance Collective is familiar with performing in outdoor and alternative spaces. Liz believes dance anywhere® is a great way to break out of the predictable and into the unpredictable. 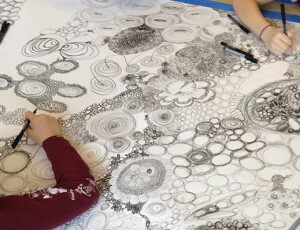 It allows the community to join in, in a playful and improvisational way. 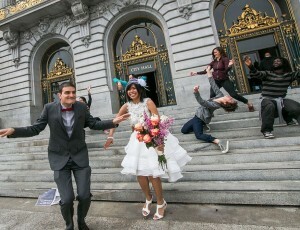 During their performance, a passerby named Walter happened upon the dancers and loved what he saw. Stephanie says he “…was so moved…that he jumped in and stayed with us till the end”. People in cars and buses peered out of their windows while passersby stopped to watch, some even clapped. Contemporary dance can be an expensive and inaccessible art form unless one is connected to the community. For Liz, dance anywhere® acts as an art intervention that exposes the general population to contemporary dance, an opportunity for both the performer and viewer. 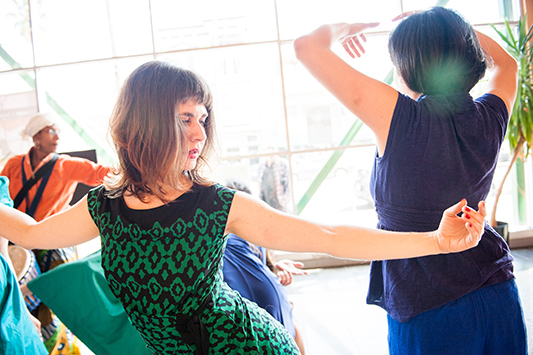 For Liz, site-specific dance is about the challenge of working with what materials that are available. 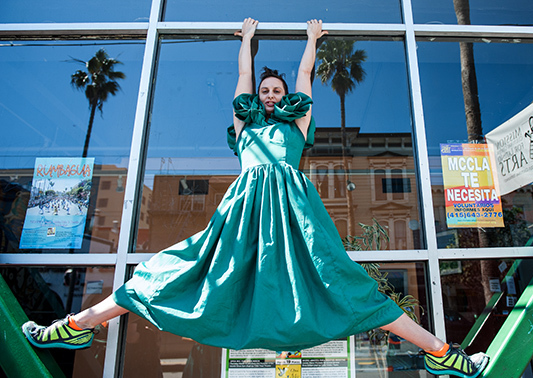 The Piñata Dance Collective was intentionally located in front of Mission Cultural Center for Latino Arts (MCCLA) for dance anywhere® this year. Liz’s goal was to bring visibility to a space that accepts and caters to Latin American contemporary dancers, a small subculture with a specific community and audience. Stephanie shared her love for the MCCLA and everything that it stands for: “a historic, artistic cultural center based in and for the Latino community of the Mission… This space speaks to a powerful, strong legacy of Latino artists and activists that made and continue making the Mission a rebellious, beautiful, alive space”. 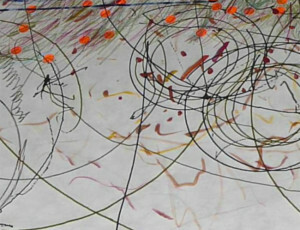 The combination of location and reputations reinforced the strength and presence of their performance that day. MCCLA will be the location for this year’s Festival of Latin American Contemporary Choreographers (FLACC) that takes place this weekend from the September 25th to the 27th. This ethnic festival highlights the unique voices and perspectives of Latin American contemporary choreographers and offers the opportunity to show experimental and nontraditional work. 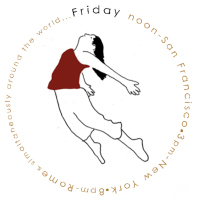 As the Artistic and Executive Director of FLACC, Liz sees a number of intersections between the festival and dance anywhere®. Both organizations aim to build community and inspire creativity. The festival begins with an opening performance on the corner of 24th and Mission. 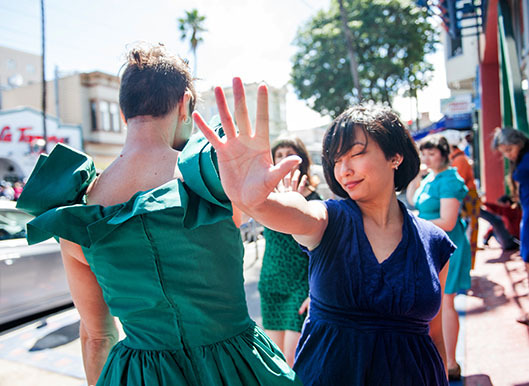 Like dance anywhere®, FLACC promotes the idea of reconsidering art and community by making the stage of the performance a public street corner. FLACC’s mission states their support for emerging and established dancers who create ‘non-traditional, border-crossing, rule-breaking, queer, avant-garde, curious, experimental, abstract, sensitive, hybridized, neo-classical, or revolutionary varieties’. With FLACC as a platform, choreographers are able to share work that confronts subjects of modern relevance or reflections on culture and society that may be deemed to cutting-edge for the usual contemporary dance stage. For Stephanie, dance anywhere® is a yearly event that celebrates how she approaches daily life. She dances waiting for the Bart. She dances in her room. She dances where she claims she shouldn’t, whether it is a meeting or a seminar. “I dance because I can’t be contained by the social and spatial constraints that attempt to hedge me in. I am just fidgety or mischievous or something. I have been disregarding ‘proper’ movement in public since I was born.” The idea of dancing in a public space is not new for Stephanie, yet dance anywhere® unites her with people around the world who also understand the beauty of this notion. 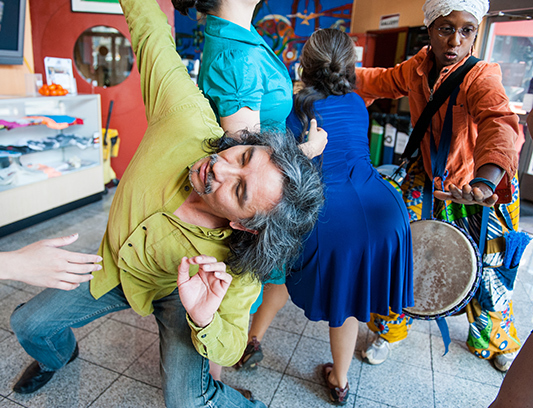 For more information on the Piñata Dance Collectives performance at MCCLA check out their dance anywhere page. For more information on Liz Boubion view her website. 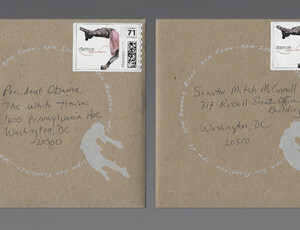 For more information on Stephanie Sherman view her website.